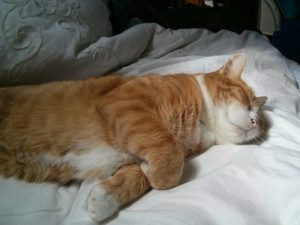 Apologies for the delay in sharing the final part of my summer adventure on Pea Green with Monte. A wonky depressed head has been a bit debilitating in recent weeks. ‘Normal’ service – whatever that is – is gradually being restored. 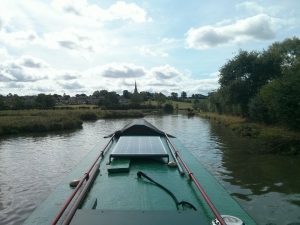 Having waved goodbye to the Ashby canal Pea Green, Monte and I began to wend our way back to Welford. We had met some lovely people on our journey (with the singular, notable exception earlier in the trip). 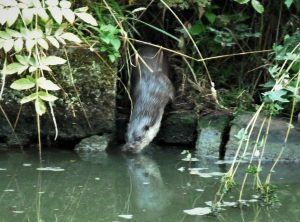 The final highlight came the night before I headed back into the marina when, quite close to Welford, Ottoline the Otter made an appearance. But, before I get to her, there are tales of people to tell. I was sad to leave the Ashby canal. I wanted to spend more time meandering back. It was also frustrating to be playing leapfrog with Social Media legends Annamarie and partner Kath. Annemarie is also a roving trader, selling her lovely watercolours. I had hoped we might be able to moor up and trade together. Unfortunately, time got in the way. Unlike me, Annamarie and Kath didn’t have a looming deadline to be somewhere, so sadly we didn’t get to sit down to talk cats, boats, and art. Next time you two! As I arrived at Hawkesbury ready for the ‘ominous’ lock a man appeared – in a Mr Benn shopkeeper type way – snapping away on his camera. My ideas of instant stardom were thwarted as he began asking about the boat’s engine and how long had I had my Barney Boat. He was one of the many Barney Boat spotters I met on my trip and was definitely the most enthusiastic. Unfortunately, I didn’t get his name, so have no idea how the photos turned out. I hope the images show an element of finesse in the way I was handling Pea Green at Hawkesbury. I suspect, however, I was exuding my normal level of fear. The photographer was keen to help me with the lock. This made me smile as of all the locks in the system this 30cm stop-lock is probably the only one where I don’t need help. The situation became increasingly farcical as another man appeared, who also wanted to help appeared. As the two men haggled over who was doing what, Pea Green was out the other side and meandering down the cut. At Rugby it was time to for another supermarket trip. I had learnt my lesson after last time’s bus-hell-incident. This time I moored as close as possible to a large Tesco. This is a mooring hotspot, but with a bit of wriggling and fender knocking I managed to pull my 32ft boat into a 32ft and 1 inch spot. Moored in front was a beautiful, brand-new, cream painted boat named Lady Penelope, behind was a hire boat. 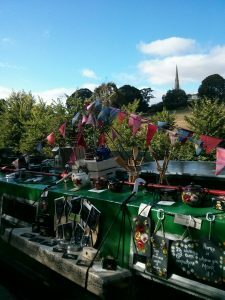 After a night at Rugby I moved onwards to Braunston for another weekend of trading. 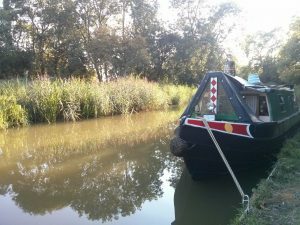 Moored outside the Stop House, it was lovely to re-meet Pauline on nb Bradwell. Having met a few weeks previously near Rugby, when we both emerged from our boats at the same time to angrily look at a speeding boat. We had bemoaned the lunacy of people and discussed the joy of being single-handers. I was delighted to hear that, like me, Pauline avoids mooring in spots where you have to use hammer in pins. Such a pain when you are single handed. At Braunston Pauline had been joined by her friend Liz and mini raggedy, cheery, dog Delilah, all were great company. We had a great evening aided by a couple of gins and a lovely meal. After a mediocre weekend of trading, in contrast to the three weeks before, I headed towards the locks and the tunnel. 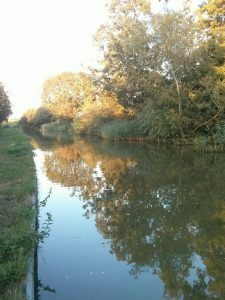 Standing on the towpath, holding the boat, as I waited for the locks, a man in overalls sauntered over. He quietly asked if I had the 8HP HG engine. This was clearly no run of the mill Barney spotter. There was only one person it could possibly be here in Braunston, outside the boatshed where Pea Green was built. It had to be Jonathan Hewson. Jonathan is ‘THE’ go to person for Barney boats and Sabb engines, having worked on them for many years. It was great to chat with him, and I was sad to not have longer, but the lock was set and I was on my way. I swear Braunston locks are my nemesis. This time I struggled to get in and over to the side, and as is the way when it’s all going haywire I had an audience on the bridge. I was joined by another boat, but couldn’t hear what they were saying over the din of the engine and water. I misheard ‘get over’ when actually I was being told ‘don’t worry we’ll push you over’…. 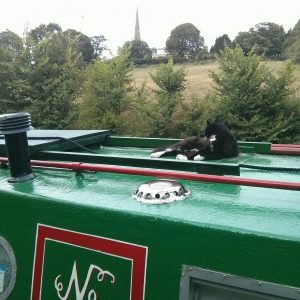 The gongoozlers quickly disappeared as the crew of Waterlilly began to fill the lock. Crewed by a lovely couple who were seasoned boaters, and very kind to me with regards to lock operation. We trundled through the locks chatting and taking our time, but hit a problem in the second to last pound. Braunston locks are well known for having fluctuating water levels, and as we emerged into the pound it was clear we couldn’t moor in preparation for the next lock. The water levels were just too low, with the muddy canal bed revealed on both sides of the pound so we had no choice but to hover the boats. As the next lock was being set the power of the water caused a mini maelstrom in the pound and sent Pea Green flying. There was little I could do as Pea Green was drawn by the force of the water into the closed lock gates. Then being thrown onto the walls on both sides of the lock entrance. I desperately tried to move away from the gates and the pound walls, yet there was nothing I could do. 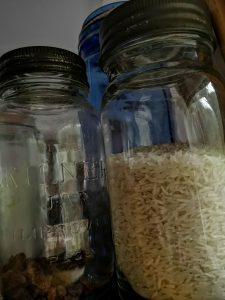 My boat’s little engine had no power to deal with the rushing, swirling water, and inside I could hear jars smashing and Monte meowing. The whole incident happened in a few seconds, before the paddle was dropped to stop the water flow. The other boat, hovering behind me, hadn’t faired much better. Waterlily was pretty much sideways on, wedged across the pound. Once some sort of normality had been restored the lock was slowly emptied and both boats entered. 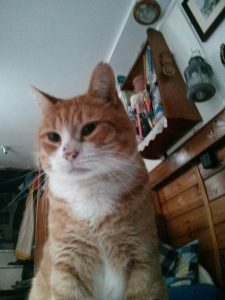 I left the helm, once we were in the lock, to pick up glass and check Monte was OK. Two of my old Kilner jars had gone flying and smashed, but luckily nothing else was damaged and Monte was safe inside his cage. I was quite shaken and decided, once again, I would not be venturing onto any rivers in my little boat! The couple couldn’t have been more apologetic. We realised we should have stayed put in the lock, as the next lock was set. A big lesson to all of us. At the time Waterlily was worried about the low water level in the lock we were leaving. With a deep draft they feared not clearing the cill. It seemed logical to deal with this first before setting the next lock. In retrospect we should have dealt with the cill question after the next lock was ready. Once through the locks we continued into the tunnel. Waterlily went first as I was concerned about my flickering headlight. Luckily, this time, it didn’t go out, however I did have the misfortune to meet a smart-arse trader coming in the other direction going to fast. His patronising ‘you should be in gear, love’ as I nudged his boat elicited a curt, ‘I am’. I felt like pointing out his interrogation sorry, headlights, were set at such an angle they made it impossible for oncoming boats to see anything at all, love…. My aim was to make it to Crick, so that I could take my last few days slowly and moor along the Leicester Line. At the Watford flight my friends from Waterlily came and helped me through the locks, along with the fabulous volunteers. 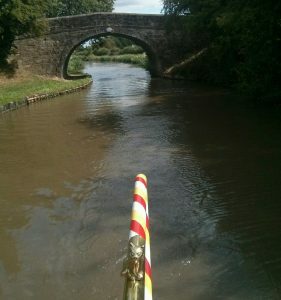 With Watford locks done there was only Crick tunnel to go and then there were no more obstacles before Welford. It was still only early afternoon so I decided to get through the tunnel and relax in Crick. Back on home turf I spent a couple of nights moored up opposite an old quarry not far from Welford. The first night a cruiser when past creating a huge wake. I did my usual antic of emerging from the boat and giving the backs of their heads a ‘Paddington Stare’. This had the desired effect as they continued merrily at great speed. As I turned around to get back into the boat, I noticed a mini ‘v’ wake heading in the other direction. Where the two arms of the ‘v’ met I spied a furry, brownish, grey head bobbing up and down. It was an otter! I dashed into the boat and grabbed my camera and scurried along the towpath in parallel to the otter. She occasionally cast me a steely glance whilst continuing her swim. At the bridge she climbed out of the water into the undergrowth before once more dropping into the water. She then made an underwater dart through the bridge hole, as I followed her progress as bubbles appeared on the water. Once through the bridge she surfaced again before swimming into the reeds and disappearing from view. After a couple of nights at this lovely spot Pea Green, Monte and I meandered back down the Welford Arm. Ahead of the boat a kingfisher skimmed the water, the only one I had seen during my entire trip. We arrived back in Welford with time to spare before the arrival of my Airbnb guest. It seemed strange to be back. I felt like we had travelled 100s of miles, yet in reality it was probably only about 30! Glad to see you back to complete the blog of your trip. I too have had the good fortune to see the otter one evening whilst moored near the junction of the Welford Arm. I often sit quietly at dusk with Maisie curled up on my lap to await the sighting of the evening wild life. Looking forward to reading your next years adventure with Monte on Pea Green. Hello Clive, yes I think there are a family of otters lurking there. Apparently they have been known to make it down the arm too! It is a v lovely spot. Thank you for reading and commenting 😊.